This is also a potting month. Most of our transplanting is done this month. Some of my trees were done last month and some will be ready to pot next month. Remember, watch your trees activity to determine the right time to transplant. Repot when the buds begin to swell. Newly potted trees need a certain amount of special after care. For the first two or three weeks, place them in a sheltered location, out of drafts and strong winds. After the initial saturation of the soil immediately after potting, do not water again until it is just starting to show a little dryness. After three weeks the trees may be moved to a sunnier location and treated normally. 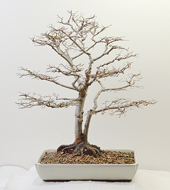 Do not fertilize a tree that has just been root pruned, for about four weeks. Then use a dilute solution, half strength, for the next three weeks. 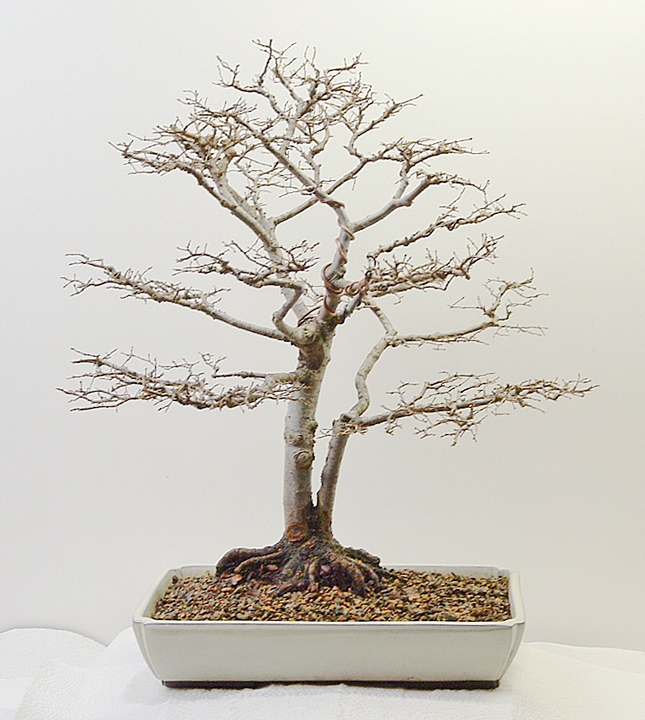 For trees that have not been repotted this year, you may start your fertilizer program now. Remember, it is better to fertilize regularly and frequently with small weak doses than to give a strong dose every now and then. This month we will cover activities that coincide with springtime. Continue to provide frost protection for emerging buds and leaves. If leaves suffer frost burn before new leaf buds have developed, some branches may die back and spoil the profile of the tree. It may mean moving trees in and out of protection during this month. Indoor tropical trees should not be moved outside until night temperatures remain above 50˚F. Shelter newly potted trees from excessive sun, wind and rain. During this period of vigorous growth, rotate your trees for even light to avoid strong directional growth of new shoots. Feeding routines should be underway at this time on established trees, not potted this spring. Monitor and restrict the amount of water to retain fine growth. Too much water will cause long shoots on deciduous trees, losing fine twigging. Pines and other needled trees will suffer from long needles instead of delicate tips. This means taking into account excessive spring rains. Some bonsaists advocate controlling growth by intentional wilting. As new growth emerges strong and upright, cut back on watering until you see the first signs of wilting; then water sparingly. Repeat this process several times this month and your new growth will appear smaller, stronger and more compact. Should you decide to try this approach, you must be able to monitor your trees constantly during this time or overwilting can cause damage or kill the tree. If you are not home during the day, do not try this method. Avoid rain or water contact on flowers, particularly azaleas and wisteria, to make them last longer. Place in a sheltered spot out of rain and dew and water only the soil and not the leaves. Under an overhang that does not restrict light is ideal. As this is the time of vigorous growth, this is also the time for activities that require it. Now is the time for grafting; bud, scion, approach and thread grafting. This is also the time to strip bark for shari and jin. The bark strips away easily and the wood will dry for summer application of lime-sulfur. While you are doing your spring tasks, evaluate each of your trees with a cold, unforgiving eye. Keep a notepad handy to jot down treatments and solutions to be done at a later date. Augment this with a photograph, if necessary.